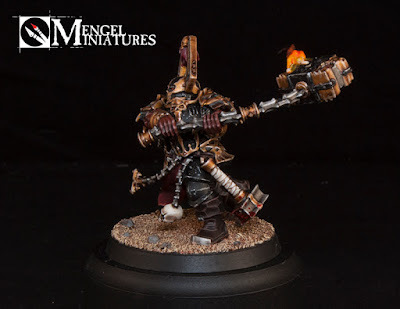 My friend and regular Age of Sigmar opponent has been working on a Khorne Bloodbound army recently. 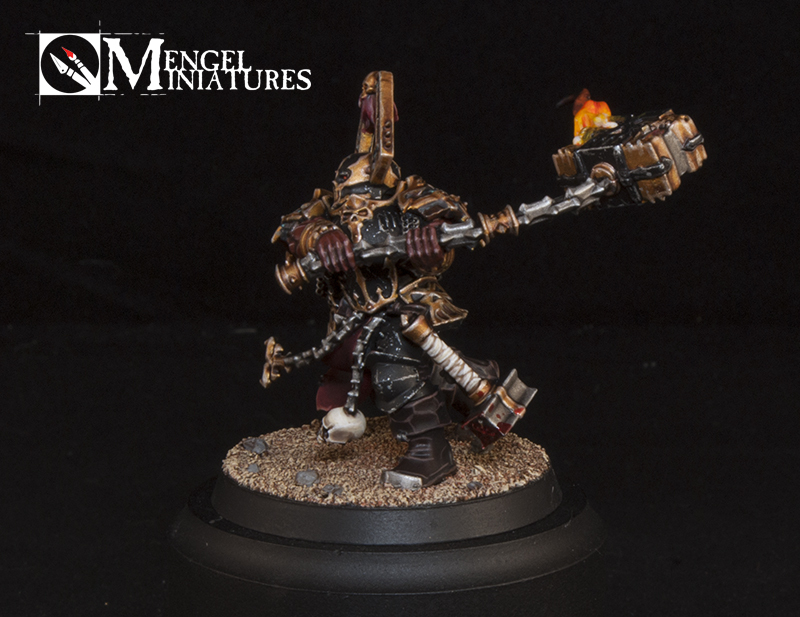 When Christmas was approaching I decided to pick up the Skullgrinder as a gift for him and have a go at painting it. I have to say, this guy was a lot of fun to work on. I have been wanting to paint some of the new Khrone models for awhile now and this seemed like the perfect opportunity to scratch that itch. 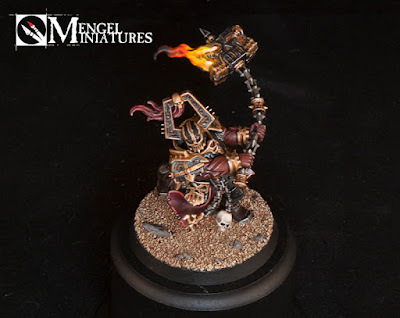 While I like the traditional red and brass scheme there was a Blood Reaver model I saw with an alternate scheme that really called out to me. The mini had black armor with gold trim and the red was reserved for clothing and accent items. The guy was also painted with a darker brown skin tone. 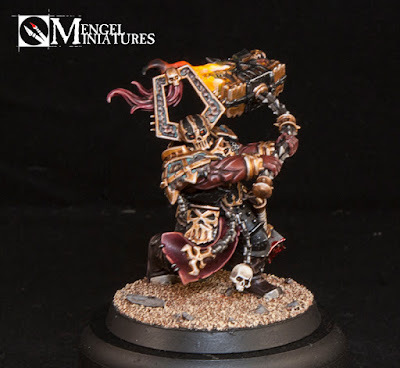 I really like that GW is starting to branch out with what skin tones they are painting. It has been awhile since I have painted a darker skin tone so I figured this was the perfect time to practice it again. I have been wanting to do a small army based around this scheme, probably centering around a core of Wrathmongers and a Slaughterpriest. Like all painters though I have more ideas and ambitions then I do time or money. While I would still like to do that army at some point, and maybe I will, this Skullgrinder scratched my itch for the time being. He was fairly quick to paint which is always good. I started him on a Wednesday and finished him that same Saturday. I would say he was about four to six hours of work time. If I was painting a unit like this it would probably be about eight to ten hours for five. This guy has a lot more details on him then the standard warrior. The black armor takes all of about 20 minutes to paint. With the gold probably taking the longest out of the main colors. I left the rim of the base black and left off an static grass so my friend can use his own to make it blend more in with his existing army more. 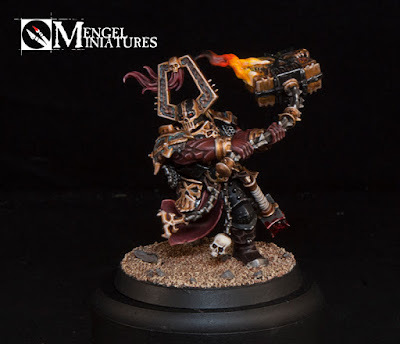 This guy would look equally at home in an army of Archaon now, just put one of Archaon's transfers on him somewhere. 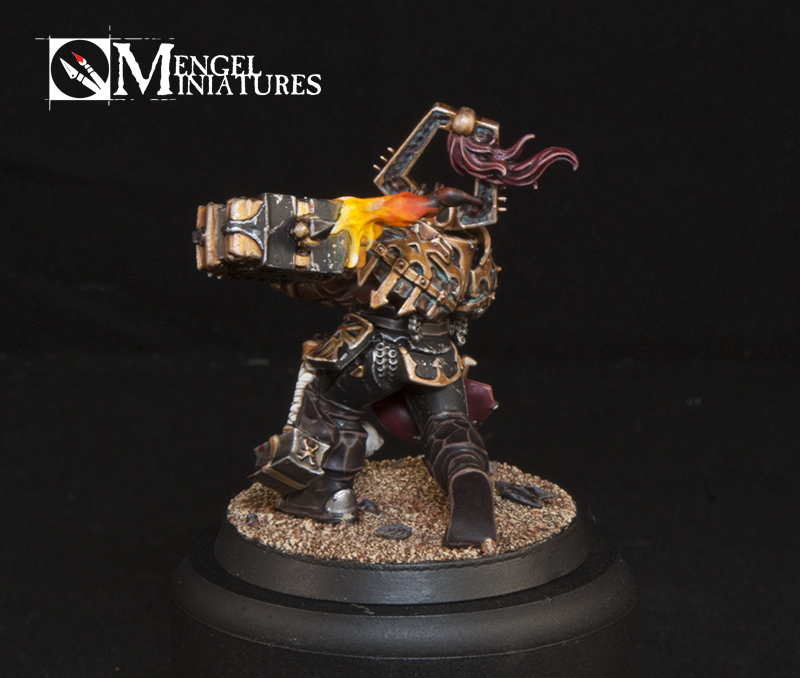 I also got to try out a few fun things on him such as a new and faster way to paint flames and getting to use my Nihilakh Oxide paint on the brass areas. I'm really happy with how he turned out and it's good to know I can paint something to a faster table top quality and still have it turn out nice. It's all about cutting corners, but making it look like you didn't. You can see a 360 degree video of him below. The music is once again provided by Adam Harvey, you can follow him on his Facebook page and listen to some more of his music on his Youtube channel. Enjoy! Please vote for him on Cool Mini or Not here. Be sure to check back in later this week for a step by step tutorial on how he was painted. 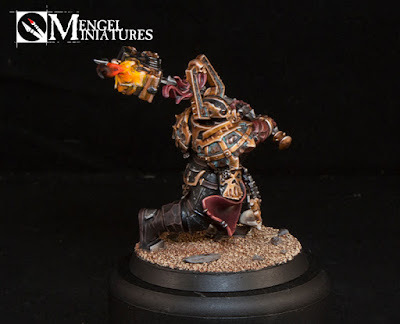 This painting guide will work equally well for the Bloodbound as it would for the Everchosen's army.